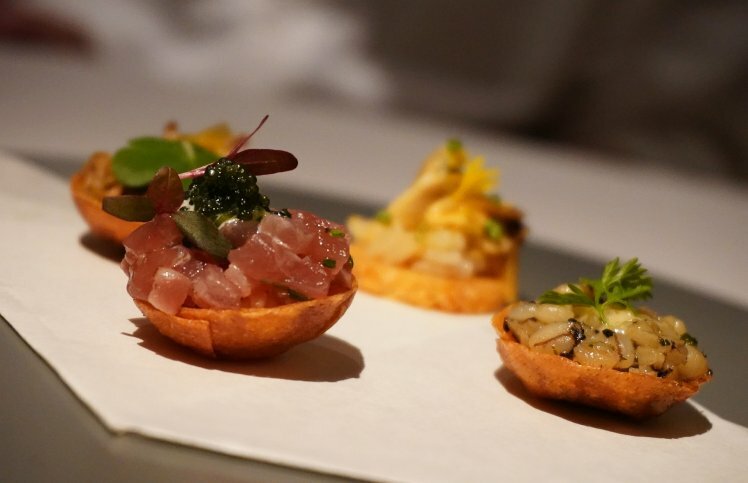 One of the returning restaurants from last year’s Goût De France is the superlative DC Restaurant, under the guidance of Chef Darren Chin. If you’re an aficionado of fine dining that ticks all the boxes – excellent cuisine, masterfully polished service, and a comfortable, appealing ambiance – you owe it to yourself to indulge in a meal at DC Restaurant, and what better time to visit than during the Goût De France event? For this year’s menu, Chef Darren Chin is offering a choice of the seven-course “Discovery Menu” or the five-course “Taste Menu”. We opted for the latter, served with a marvellously curated selection of French wines courtesy of DC’s most impressive chef sommelier, Agnel Sathiananthan. 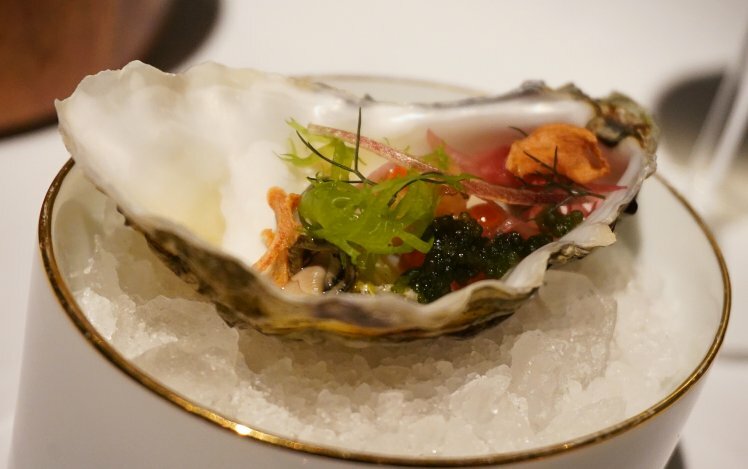 Both menus begin with a Prelude comprising several components, including a gorgeous poached Irish oyster with Oscietra caviar and celeriac, strip-jack mackerel served with bitter lemon cream, and a selection of bite-sized savoury tartlets. The first course got us off to an excellent start with DC’s Spring Seafood Medley, a beautifully presented plate of various treats from the sea, our favourite of which was a perfectly seared Hokkaido scallop. 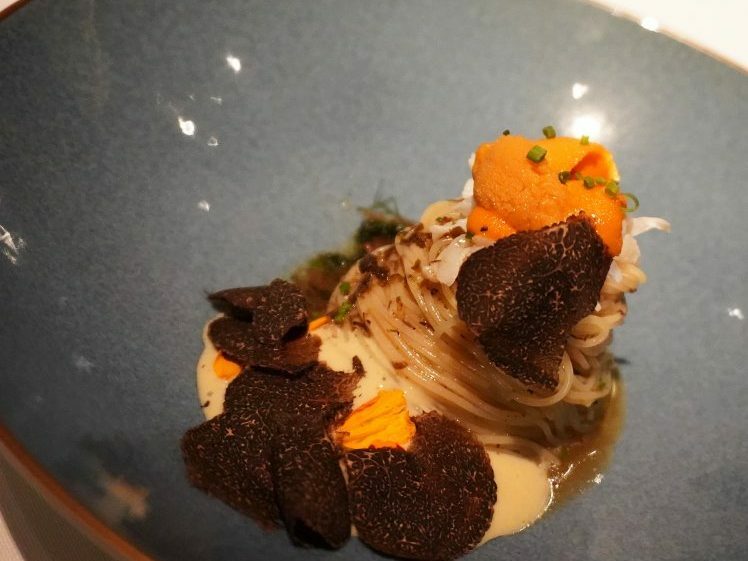 The next course really wowed us – DC’s new signature Cold Capellini with Savoury Seafood Sabayon and accented by tableside-shaved black winter truffles. 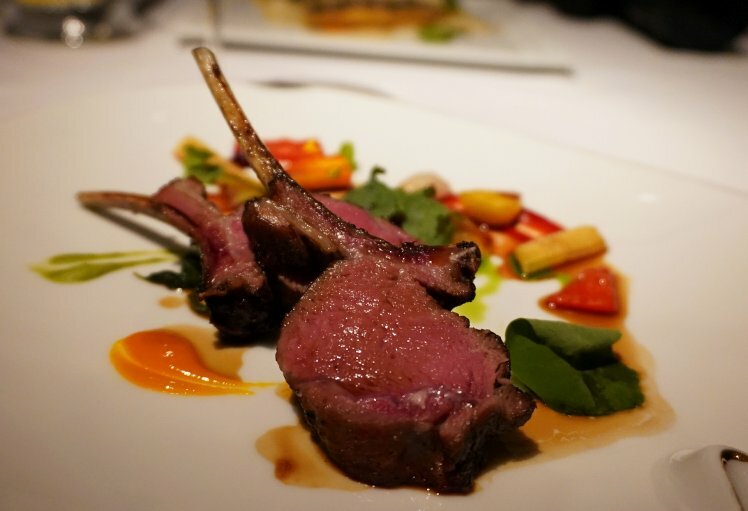 Just a fabulous dish and we’re delighted to see this one taking a firm place on the restaurant’s regular menu, too. The next dish featured Alaskan King Crab meat, braised and served with heirloom tomato passata, sweet basil, and a delicate gelee made from tomato water. This uncommonly prepared and presented crab dish was just another example of the creative manner in which seafood is used in dishes at DC Restaurant. After a brief respite and small palate cleanser, we moved on to the main course, which offers a choice of French sea bass, 14-hour slow-roasted rack of lamb, half of a Britanny blue lobster tail, or a magnificently decadent Japanese Hidagyu Full-Blood A5 Wagyu (the latter two options attract a top-up charge beyond the menu’s standard price). Tempting though the Wagyu option was, we decided to go for the fish and lamb choices, which were both outstanding. 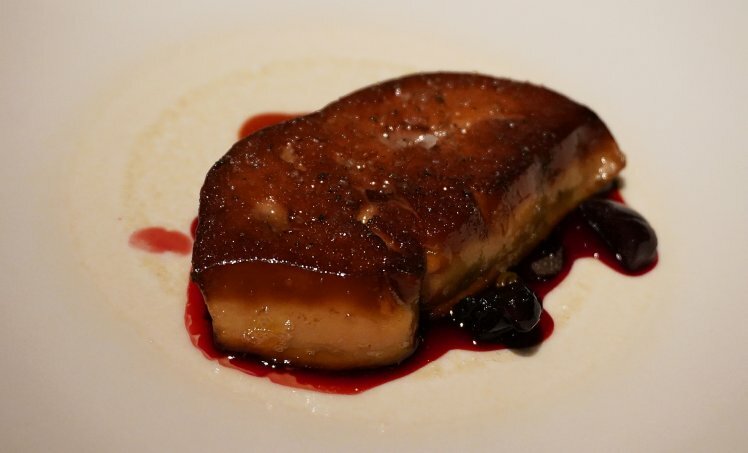 We also indulged in the optional pan-seared foie gras offer (60g), served with black perigord truffle and Amerena cherry, and it was utterly delicious: perfectly prepared, plated, and presented (at the suggestion of Yann, the delightful maître d’) as a separate course. DC Restaurant is justifiably well-known for its incredible trolley of Appellation d’Origine Protégée cheeses, from which diners can select five to conclude their meal. 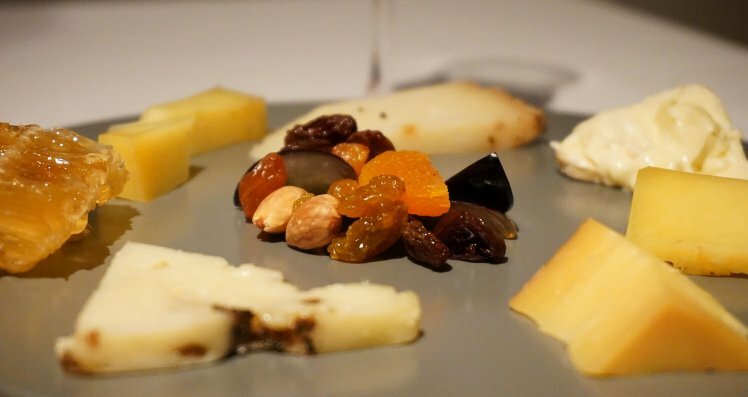 The cheeses are cut and served tableside and accompanied by dried fruits and a section of fresh honeycomb from the hills of Chiang Mai, Thailand. The selection of fine AOP cheeses were further complemented by a glass of Royal Oporto, a superbly rich and complex 40-year-old aged Tawny Port. 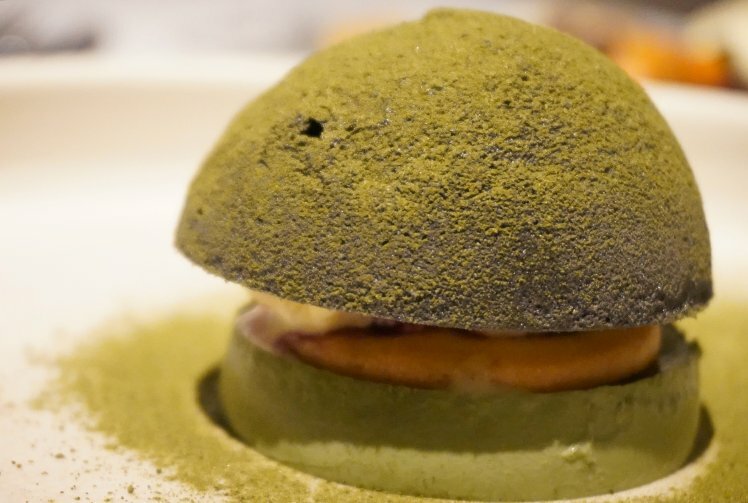 Another option for the final course is a truly enjoyable dessert simply called Black | White | Green, comprising an airy, crunchy charcoal meringue, matcha green tea pannacotta, and white chocolate ice cream, accompanied by mulled blueberries, strawberries, and boozy cherries. Black White and Green … and Delicious! Located in TTDI, DC Restaurant takes its place comfortably among Kuala Lumpur’s best restaurants, and does so without unnecessary flash or fanfare. The menu prices reflect the quality of the food and the uncompromising manner in which the dishes are prepared and served. We were impressed by the polished, professional service, the knowledge of the floor staff, and the near-choreographed execution of food prep on display by the team of cooks in the kitchen. 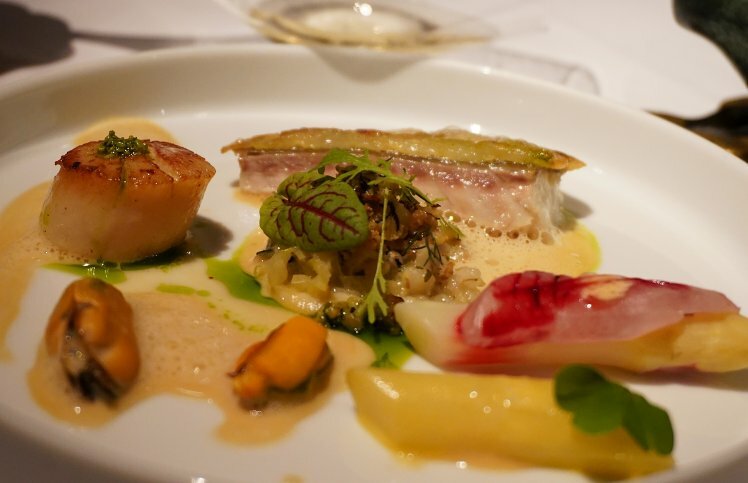 Though the short-lived days of the Goût De France event (through 24th March) bring a great opportunity to indulge in a modernist take on fine French cuisine at DC Restaurant, the truth is, anytime is a good time to enjoy a meal here. The restaurant, in a testament to both its intimacy and embrace of delivering a truly well-paced and special experience, offers just one seating per night. When you reserve a table here, it’s yours for the balance of the evening so that you can take your time and savour the procession of dishes so expertly created and served here. We recommend you do just that. Bonne degustation!